All I.P.A. 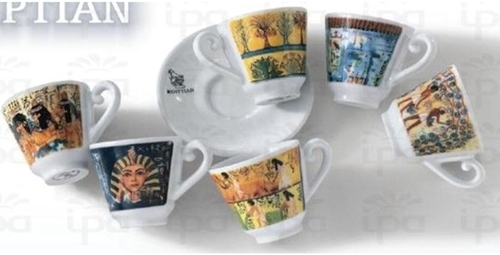 products guarantee an excellent capacity to exalt the aroma of coffee. High resistance to thermal shocks from dishwashers, maximum resistance to scratches and impacts and absolute hygiene guaranteed by being perfectly waterproof. The experience, research and scrupulous application of specific know-how give I.P.A. products unique characteristics, dedicated to users who require a maximum level of quality, indispensable in professional use. One of the ceramic materials used in producing crockery, hard feldspatic porcelain, is the best choice because it best synthesises resistance, hygiene and aesthetic features. Unlike other ceramic materials, I.P.A. porcelain is produced at high temperatures (1400 �C), in a controlled atmosphere, (reductant) and with scientifically measured very pure raw materials. The last confirmation of the quality to be found in I.P.A. products is guaranteed by scrupulous and constant controls, "cup by cup", which accompany the product during the production cycle.